The system is used to automatically register and recognize the numbers of railway wagons and cisterns at railway nodes, transit stations, entrances to loading/unloading points in order to obtain operational information in an automatic mode about the movement of rolling stock of railroad facilities, search for wagons by their inventory numbers, Counting the number of wagons, monitoring the condition of wagons and cisterns. Monitoring of control passages in real time and viewing the saved video recording. Keeping a database of rail transport. Notifying the operator of special-priority rail transport travel. Detecting suspicious travel patterns and rail car delays. Gathering data for transport logistics management systems. Tracking rail cars: rail car location and travel control. Minimization of rail car stand-by losses. Generation of reports on rail transport passage. Automatic generation of dispatch documents. When integrated with thermal imaging equipment, the System can measure the filling level of tank cars at the pouring site. Lowering the impact of human factor. Automatic reading, registration and record-keeping of rail transport of rail vehicle numbers from the image acquired by a thermal imaging camera. Automatic detection of rail transport travel direction..
Notifying the operator of special-priority rail transport travel.. Combined record-keeping and registration of rail vehicle and transport container numbers. of rail cars in a train. 1 The number of recognition cameras for one PC: 1 to 8. 2 Integration of distributed PCs into a single system. 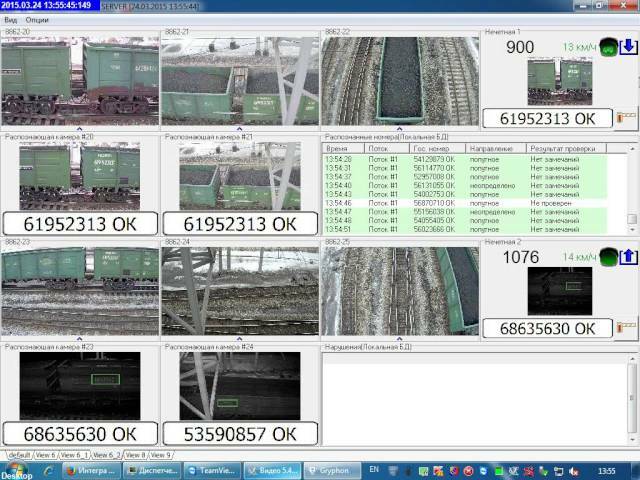 3 Automatic registration of rail vehicle numbers from a video. 4 Color characteristics of vehicle numbers – dark on the light background, light on the dark background. 5 Recognition of freight rail cars: boxcars, gondolas, tank cars, refrigerator cars, and other special-purpose cars. 6 Rail vehicle number control using the reference figure. 7 Rail transport speed limit – up to 40 km/h. 8 Detection of rail transport travel direction. 9 Integrated operation with the subsystem for record-keeping and registration of rail vehicle and transport container numbers. 10 Combined results of recognition from two cameras reading rail vehicle and transport container numbers from different sides. 11 Recognition possibility – up to 96 %. ОАО "РЖД", начальник «Южно-уральский региональный центр безопасности», Ляпин Ю.Ю. ОАО «РЖД» структурное подразделение «Южно-уральский региональный центр безопасности», Ляпин Ю.Ю.